Thanos is already the biggest bad guy in the Marvel Cinematic Universe, but Avengers: Infinity War director Joe Russo wants to turn him into a cultural icon. Speaking to ComicBook.com at Comic-Con International: San Diego, Russo says he wants to put Thanos on the same level as Darth Vader, the instantly recognizable villain of the Star Wars universe. Thanos is on a quest for the Infinity Stones to adorn his Infinity Gauntlet, thus granting him infinite power. When asked how this quest affects the structure of Avengers: Infinity War, Russo brought up his and his brother and co-director Anthony Russo’s habit of using popular films as touchpoints. Will Thanos emerge with as big a profile as Darth Vader by the film's end? Will fans begin speculating over who would win in a fight between the Mad Titan and the Dark Lord of the Sith? Eager audiences will have to wait until May 2018 to find out. Avengers: Infinity War currently has a 4.34 out of 5 ComicBook.com User Anticipation Rating, making it the most anticipated upcoming comic book movie among ComicBook.com readers. Let us know how much you're looking forward to Avengers: Infinity War by giving it your own ComicBook.com User Anticipation Rating below. Avengers: Infinity War brings the Guardians of the Galaxy together with the Avengers to face off against Thanos and his minions. 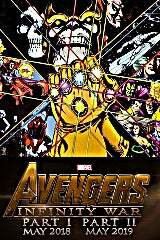 Avengers: Infinity War is directed by Anthony and Joe Russo, from a screenplay by Christopher Markus & Stephen McFeely, and stars Robert Downey Jr., JoshBrolin, Mark Ruffalo, Tom Hiddleston, Chris Evans, Chris Hemsworth, JeremyRenner, Chris Pratt, Elizabeth Olsen, Sebastian Stan, BenedictCumberbatch, PaulBettany, Samuel L. Jackson, Cobie Smulders, Benedict Wong,Zoe Saldana, Karen Gillan, Vin Diesel, Dave Bautista, Pom Klementieff, Scarlett Johansson, Benicio delToro, Tom Holland, and Anthony Mackie.